Born Aaron Brown in Fulton, Missouri, The Dixie Kid was a clever boxer who was deft at counterpunching. Kid battled the best in the welter and middleweight divisions. By virtue of a 20-round victory by foul over Barbados Joe Walcott, Kid captured the world welterweight title on April 29, 1904. He drew with Walcott over 20 rounds in a rematch two weeks later (May 12th). His claim to the world title would be disputed over the years (the Kid often pursued heavier opponents), although he is often regarded as champ until 1908. Among the men he met include Jimmy Clabby, Mike Twin Sullivan, Willie Lewis, Sam Langford and Hall of Famer Georges Carpentier, whom he TKO'd in 5 rounds while in Europe in 1911. 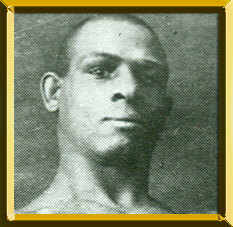 A veteran of over 150 bouts, he retired in 1920 and died on April 6, 1934 in Los Angeles.